The University of Connecticut Board of Trustees voted unanimously Friday to sell the former West Hartford campus for $5.2 million to a global financial-technical firm to develop a new, $283 million headquarters there. The project planned by Seven Stars Cloud Group, which will create an estimated 330 jobs over the next five years at its technology headquarters, will be supported by a $10 million loan from the state of Connecticut. Seven Stars Cloud also would agree to assume all responsibility for pollution issues on the property. “The board is very happy to be moving this property into productive hands,” Tom Kruger, chairman of the Board of Trustees, said afterward. The 34-acre campus includes five buildings on the west side of Trout Brook Drive and another 24 acres that include parking and athletic fields on the east side. UConn officials estimate the maximum cost of demolishing all buildings and removing all contaminants from the remains and the soil would be $8 million. But Scott Jordan, the university’s chief financial officer, said the cost likely would be less if some of the buildings are left standing. UConn also anticipates annual savings of $500,000 once it no longer must heat and otherwise maintain the West Hartford site. “We’re very pleased that we were able to pull this together and avoid those costs in the future,” Jordan said. Bruno Wu, executive chairman and CEO of Seven Stars Cloud Group, said during an announcement earlier this week that he anticipates keeping and renovating several of the existing buildings. There also would be additional landscaping work done on site. The company anticipates constructing new buildings during future phases of development there. Under state law, liability for known and unknown environmental hazards can revert back to a former owner. Should new contaminants be found or should the planned development not happen, UConn and the state still could be at risk of future liability. To offset the risk of future contamination-related claims against the state, the sales agreement approved Friday also calls for Seven Stars Cloud Group to provide the university with $250,000 toward the purchase of a liability insurance policy. Jordan said UConn officials anticipate this should allow for the purchase of $15 million to $25 million in coverage. Seven Stars Cloud Group still needs to obtain approval from West Hartford zoning and other local government agencies. Jordan said university officials anticipate the sale to be finalized after this process, approximately in September. Gov. Dannel P. Malloy said development of the new technology and innovation center would take an estimated six to nine months after site purchase and local approvals have been resolved. UConn moved its branch for the Greater Hartford area from West Hartford to downtown Hartford in the fall of 2017 at a site anchored by the former Hartford Times Building. The deal with Seven Stars Cloud Group is not the first time the university has tried to sell the former West Hartford branch. UConn had signed a letter of intent in March 2016 to sell the property for $5 million to the Weiming Educational Group, a Chinese education group looking to develop a private high school on the site. But under state law, when the state sells property, the town in which it is located gets the right of first refusal. 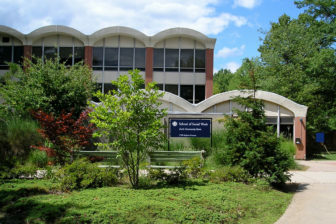 West Hartford exercised that right in May 2016, but subsequent talks with UConn broke down and, in December 2017, West Hartford abandoned its plans to buy the property.